Win Texas Rangers Opening Day 2017 Tickets from ACVB! Of all days, Opening Day (this year, Opening Night), should be considered a national holiday. 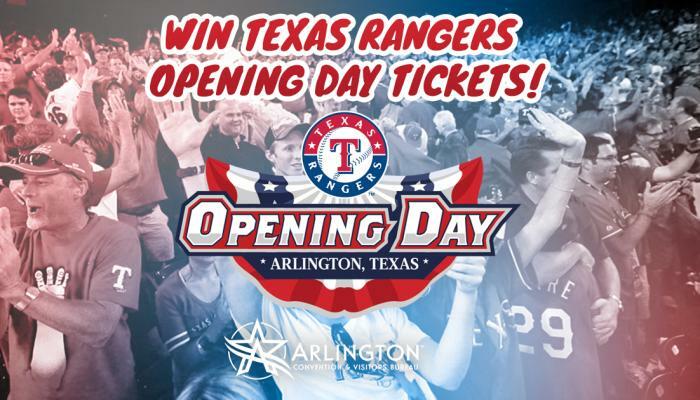 For us at the Arlington CVB, it&apos;s one of our favorite holidays to celebrate, that&apos;s why we&apos;re sending two fans to the Texas Rangers Opening Day 2017, and giving them an Arlington CVB swag bag to commemorate. All you have to do is visit the link below, enter the required fields, and you&apos;re entered. For every time you share, a share adds your name to the hat an additional 5 times.